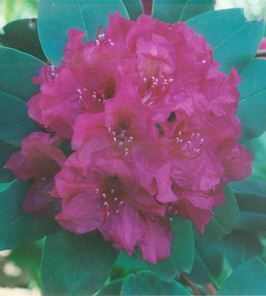 In partnership with the Maine Chapter of the American Rhododendron Society and the late Joe Parks, the University of Southern Maine has established a unique rhododendron and azalea garden on the Gorham Campus. The garden is home to over 60 plants, representing more than 40 species of the Ericaceae family of woody, flowering plants. Situated near the historic Academy Building, the garden highlights the oldest section of campus. The garden site includes a mix of old oaks and maples, providing the rhododendrons and azaleas with the shade they prefer. The entrance to the garden is accessible from University Way near Robie-Andrews hall or from the stone steps coming up from School Street (Route 114) near the Campus Ave.
As the garden develops there will be more information on this site, including a garden map, catalogue of plants, walking tour, schedule of events in the garden, and information on hybridization.